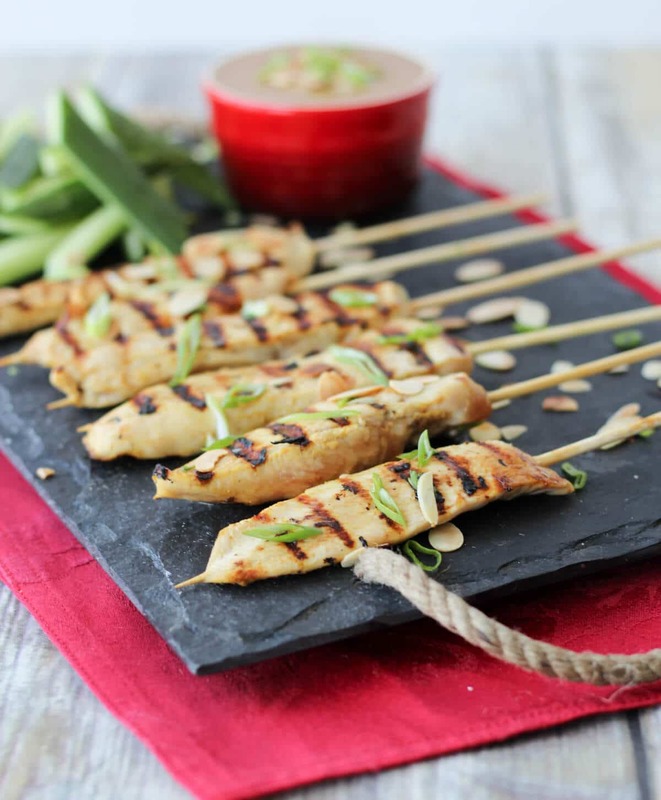 This gluten free chicken satay recipe with Thai almond sauce is a perfect healthy grilled Summer appetizer that everyone will love. I know I’m about to make myself sound like a super white girl (I am pretty pale, to be fair), but chicken satay was the first non-chicken-ball Asian food I ever had. And I was 16. I know- I had a steep learning curve about food ahead of me to get where I am today. To my defense though, I was raised by two non-foodies and was living in Peterborough at the time. One day, my boyfriend’s parents ordered in from a Thai restaurant and I nervously tried my first order of chicken satay with peanut sauce. Honestly, I’m not sure what I was scared of, but it just goes to show how sheltered I apparently was. Being a home chef with an arsenal of Asian ingredients in the house at any given time, I thought I would do chicken satay up my way. I wanted to make gluten free chicken satay for my GF sister (which means tamari, instead of soy), and whip up a delicious Thai almond sauce for a unique twist. 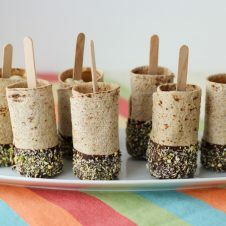 This is a perfect pool party or cottage snack because it’s hand-held, dippable and super lean. The chicken is marinated in lite coconut oil to yield a super moist, yet lean source of protein. I then use almond butter in place of the traditional peanut butter to make a nutrient-rich Thai almond sauce. I love that almonds have a combination of fibre, protein and healthy fats to keep you feeling fuller longer. 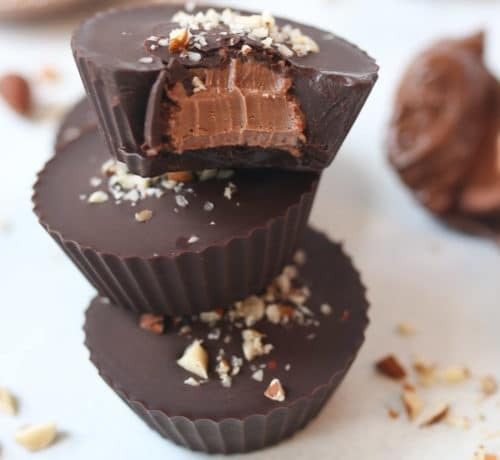 They’re also packed with vitamin E, B2, magnesium, phosphorus and iron! 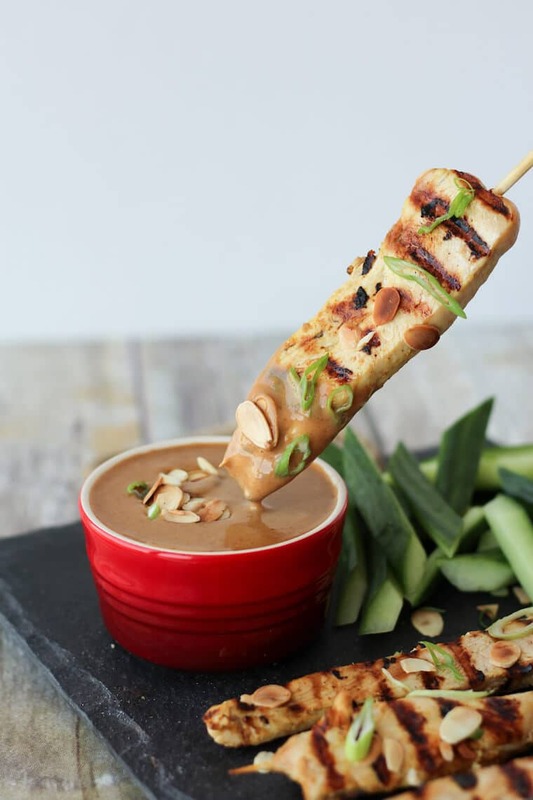 These gluten free chicken satay with Thai almond sauce dish I would personally try to fill up on at the Summer BBQ, cottage or pool party, leaving me a little guilt-free wiggle room for dessert or a cocktail. 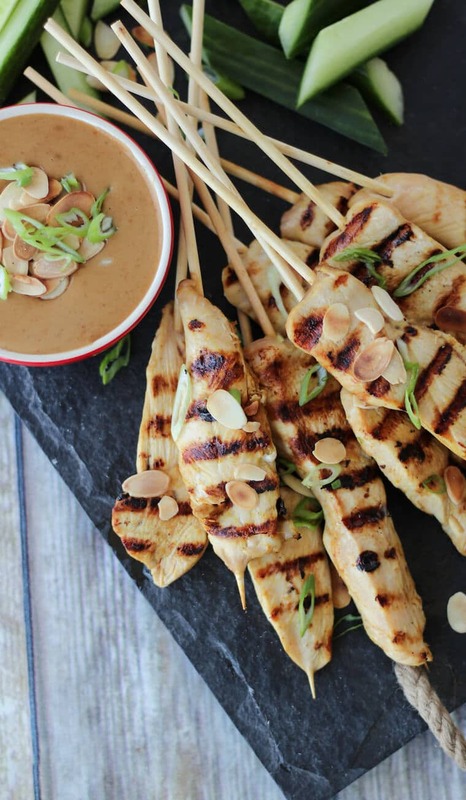 These Gluten Free Chicken Satay with Thai Almond Sauce is the perfect Summer BBQ dish! 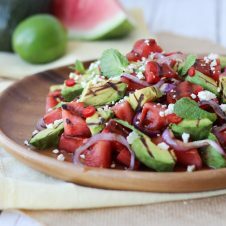 Looking for more great Summer tapas and appetizers? 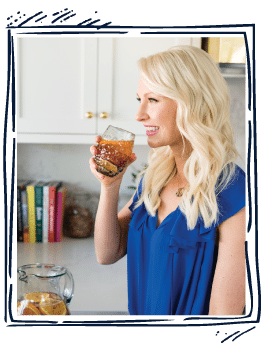 Check out #TheRecipeRedux group below for more healthy inspiration from fellow RDs! 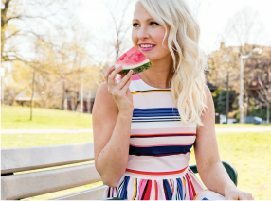 What are some of your favourite grilled appetizers for Summer? 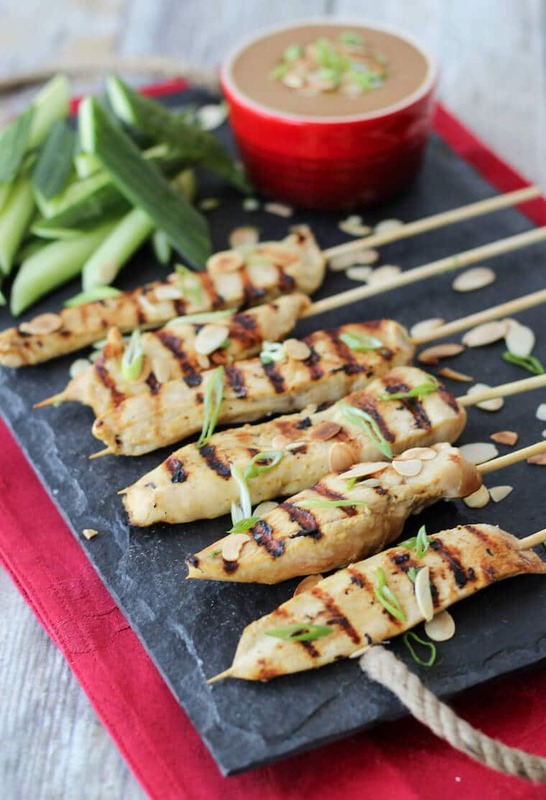 Have you tried making gluten free chicken satay and a Thai almond sauce? 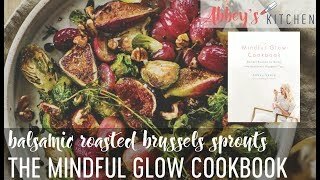 Leave me a comment below with some of the crowd favourites in your circles- I would love to try them out! Combine the marinade ingredients and transfer to a resealable bag with the chicken. Refrigerate and marinate for 2 hours. Meanwhile, mix together the almond sauce ingredients and set aside. Preheat your grill to medium high heat. Thread the chicken pieces onto long skewers (being sure to soak them first if they are wooden) and grill for about 4-5 minutes per side, until cooked through. 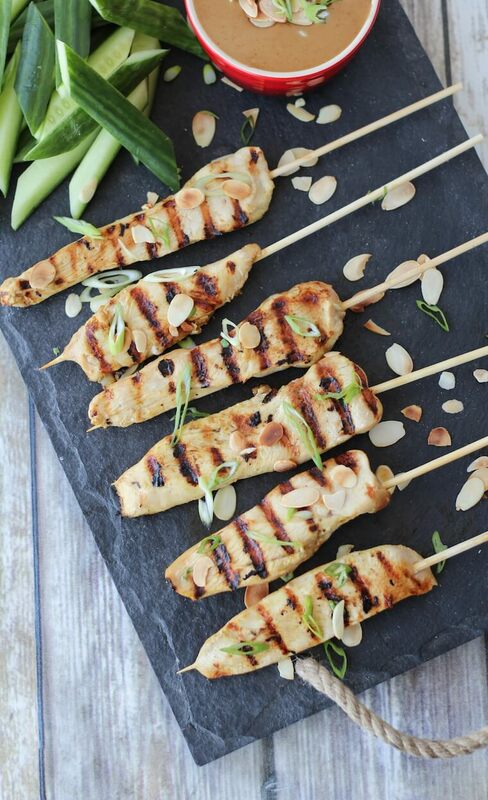 Serve with the almond sauce, garnished with toasted almonds and green onions. Disclosure: This post may contain affiliate links. If you purchase from the link, I make a small commission that adds no cost to you, but helps me pay for my blog! Thanks for your support. 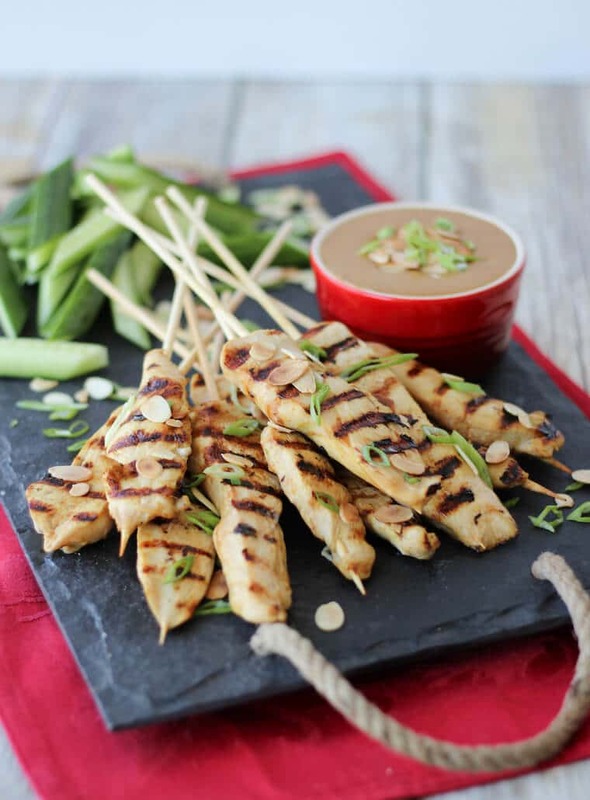 this is definitely a great grilling recipe and everyone usually loves satay with peanut sauce. Totally! But this one I made an almond sauce instead and it’s just as good as peanut sauce! Love chicken satay! I think mainly because I love dipping it in the sauce! Right! Everything is much more fun when there’s dipping sauces. Hey There ! I’ve made a LOT of dipping sauces for satay. But THIS one is absolutely wonderful. I don’t miss the peanut butter and the flavors are spot on. This is now to be my go to satay sauce. Have not tried the chicken yet – as it is presently bathing in the marinade. 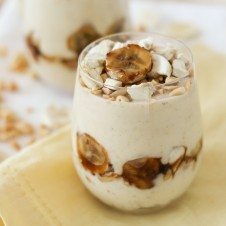 This sounds amazing and healthy as well! Bookmarking for the weekend! I love chicken satay! :D! I’ve never tried making it on my own though…I’m definitely going to need to–that sauce sounds amazing! Thanks so much- enjoy Farrah! 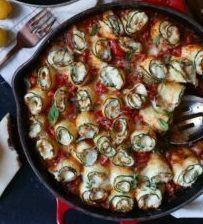 its a great easy recipe.